R.L. (Bob) Nielsen at Purdue compiled this list and plans to update it as new information becomes available. If the thought of more rain makes your tempted to drink something stronger than black coffee, then consider getting your mind off of harvest and consider the following websites. Any listing of a website is not an endorsement of that site by the university. bing maps similar to google maps. Sometimes includes pictures in the "bird's eye" view. The recent freezing temperatures essentially stopped corn growth for most of Kentucky. Farmers that had corn planted late for silage are wondering if the corn crop is still suitable for silage. The following is a brief summary, mostly from AGR-183: Late Season Frost-Damage to Corn for Silage. Corn will ensile well at moisture levels less than 70% for upright silos and less than 75% moisture for horizontal silos. 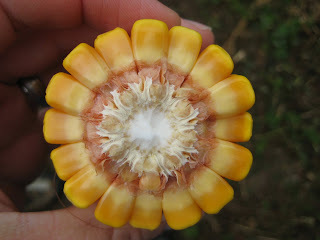 Corn harvested at 62% to 68% moisture (late-dent stage) is ideal for ensiling. Gibberella ear rot is caused by Fusarium graminearum, the very same fungus that causes head scab of wheat. Normally Gibberella ear rot can be a problem in northern state, but in Kentucky, we generally see very little of this disease. I am hearing of reports of epidemics of Gibberella ear rot in central and even southern areas of neighboring states to our north. Again, that doesn’t seem surprising, given the cool, wet weather generally experienced post-silking in many fields. "Yield Penalty" in Corn after Corn: Could Root-Attacking Organisms be the Cause? For decades, mono-cropping without rotation has been known to often result in reduced yield. Indeed, long-term studies at the University of Kentucky show that first-year corn-after-corn commonly experiences a "yield penalty" that growers should factor into their economic analysis (Figure 1). One of the interesting things about this yield penalty is that it appears to be greater as corn yield increases. 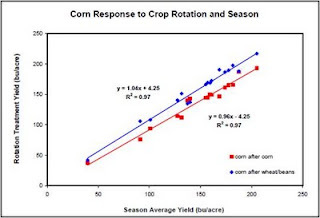 This suggests that, in the future, the "rotation effect" will be not diminished (rather, will be enhanced) in the presence of better varieties, better management, and excellent corn growing conditions. Figure 1. Comparison of yields first-year corn-after-corn vs. a one-year rotation for the 1989 to 2006 production seasons. Considering the cool, wet, and late year we have just experienced, it should not come as a surprise to anyone that certain late-season soybean fungal diseases are more extensive than usual. 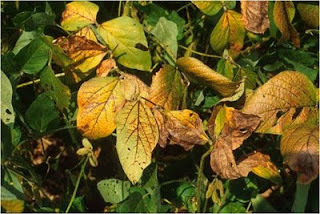 In a more typical year, crops that mature in late summer, especially early maturing varieties planted early, tend to experience the most intense foliar, stem and pod fungal disease pressure. This is because those crops are filling pods and maturing at a time when conditions tend to favor disease development (hot and wet). Normally, doublecrop and other late-planted crops are less susceptible to late-season fungal diseases because they mature in September-mid-October when conditions tend to be dry. Not this year! On October ninth the United States Department of Agriculture released their monthly crop report and latest supply and demand figures. In the October report USDA slightly increased both corn and soybean production over last month. The October ninth crop report pegs corn production at 13 billion bushels, about 8 percent more than 2008-2009 crop. The USDA is expecting yields to be a record at 164.2 bushels per acre, up 10.3 bushels per acre over last year and up 2.3 bushels from the September report. For Kentucky, the USDA increased average yield by 2 bushels per acre from the September estimate for an average yield of 157 bushels per acre. If realized this would be a record corn yield for Kentucky. 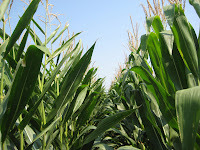 According the October 4, 2009 edition of the Crop and Weather Report, about 86% of the corn crop was mature. The first occurrence of a fall freeze is normally mid to late October in Kentucky. A freeze event on corn that is not mature can reduce yields, depending on the stage of kernel fill. Kernels are sprouting in the ear in many fields around the state. Normally, these sprouts are occurring from the lower portion of the ear. 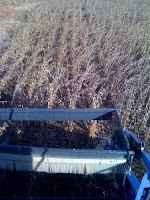 The ears typically are upright, the husks are open, and water collected at the base. The kernels are at blacklayer (35% moisture or less) and the water in the husk allows these kernels to imbibe water and germinate. Sprouting kernels are not a direct hazard to livestock. However, molds are sometimes associated with sprouting and some molds can produce mycotoxins. 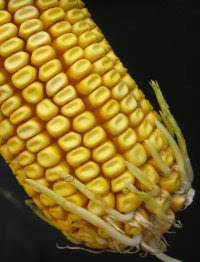 If corn is being used for livestock feed, have it checked for mycotoxins. Sprouting kernels will reduce test weight and yield, slightly. This is just a symptom of the cool, wet fall. Fall Armyworm Flights Increase --- Again! Fall armyworm (FAW) moth counts are again increasing in the UK-IPM pheromone baited trap at Princeton. This is not completely unexpected. We see some sort of flight increase about this time every year. As to whether or not it is important is really a matter of when the caterpillars appear in relationship to your crops. At present FAW counts remain lower than the numbers associated with the known outbreak of 2007 and if they continue to a similar number, the peak will be a week or so later. The caterpillars from that peak could be a threat to early planted wheat. In 2007 several individuals reported large FAW populations in wheat fields. However on the whole these populations were feeding on the volunteer corn and not the wheat. If you find large numbers of caterpillars be sure to distinguish on what they are feeding. Even though the numbers are large they may be (and likely are) doing no harm at all. The crop most threatened by the fall occurrence of FAW is newly seeded grasses. This could be wheat but are generally, hay fields, lawns and cover for roadsides, construction sites etc. In the very early stages of these seedling grasses FAW can kill the plants. Once a good root system is established plant death is unlikely. FAW will be present until the first hard frost. These are not cold tolerant insects; they migrate in annually from the gulf coast states. So, once cold weather becomes the standard this insect will disappear. If insecticidal control were to be needed FAW will not be hard to kill in these seedling systems. Any product labeled for FAW and the crop of interest will provide sufficient control. One really only needs to reduce the population until cold weather arrives. BE very, very wary of replanting. It is often the case that damaged plants will survive and replanting often results in a double stand. USDA’s mid-September crop report predicted record level corn yields for Kentucky of 155 bushels per acre. Coupled with increased acreage, the state’s production could top 175 million bushels, which is also a record. However, a potential ‘fly in the ointment’ with this year’s crop is the delayed harvest coupled with damp weather which has led to stalk, ear and kernel rots. As noted in previous news stories, potential problems with field fungi (Diplodia, Gibberella, Fusarium, etc.) have lead to concerns about subsequent storage. While not all fungi produce mycotoxins, mold-damaged kernels are more susceptible to those that do. So it is best to err on the side of caution and check corn lots with field mold for mycotoxins before feeding to livestock. When harvesting mold-damaged corn, adjust combines to minimize mechanical damage so that sound kernels are protected and to maximize cleaning, so that lightweight kernels are removed. Harvest, handle and store damaged corn separately when feasible and market early to reduce demands on storage management. Grain moistures above 18-20% favor the growth of field fungi and the longer corn remains in the field the greater the chance of mycotoxin production. Thus, damaged corn should not be allowed to dry in the field to avoid drying costs. Corn with light damage should be dried to 15% within 24 hours after harvest and cooled to 40 degrees as soon as weather permits, in order to control mold growth during storage. This will create a storage environment within the grain mass that is below 65% humidity, which is dry enough to control mold growth and development (see values in the equilibrium moisture table). Corn with heavy to moderate damage should be dried to 13 to 14%, respectively, cooled as quickly as possible and moved before March. The table below presents the equilibrium moisture contents for shelled yellow corn at different temperature and relative humidity conditions. Example: Corn that is 40 degrees and 13.7% moisture will create a relative humidity of 55% within the grain mass, which is safe for storage. If mycotoxin problems are suspected, check with crop insurance providers to see if adjustments may be needed and how to account for the areas that are impacted. Insurance adjustments generally need to be made on standing corn at or before harvest.